Sequins aren’t just for New Years Eve! A little touch of sparkle can take a look from a casual Saturday outing to drinks with friends on Saturday night. 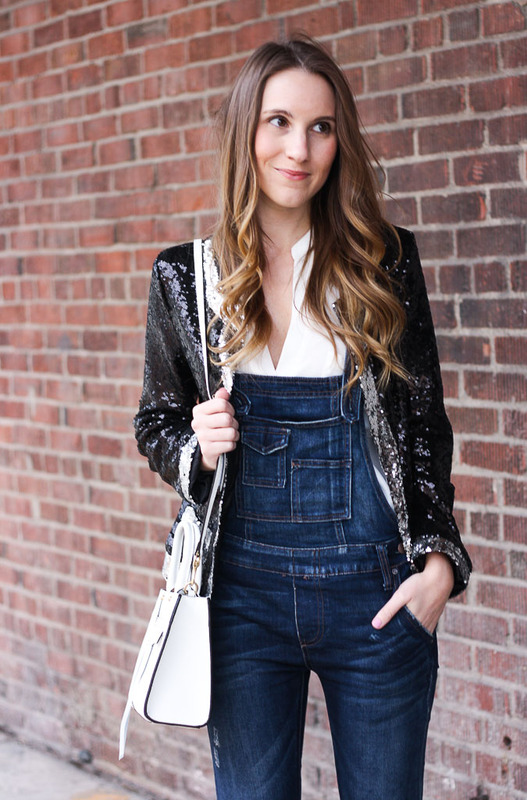 This little sequin jacket dresses up my favorite overalls, creating a look that’s perfect for going out, while the overalls tone down the sequins just enough so it’s not too over the top or dressed up…a perfect balance. Check out the first part of my How to Wear Overalls series HERE. 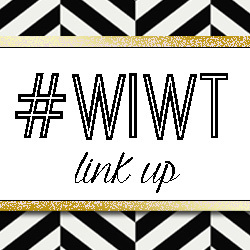 This weeks featured blogger is.. The Students Wife! As you know I am all about breaking fashion “rules” so I loved that she posted something about wearing white “too early”. This outfit is simple and guaranteed that most of us have similar pieces in our closet so take notes and break out your white jeans! Next Post Bauble Bar Spring Sale! So cute!! I love the overall trend but have yet to find the perfect fit…I've heard lots of good things about this Free People pair – might have to give them a try!! Funny story, I actually just put overalls in my Asos cart right before I started reading your post! I loved how you styled this! The shoes are gorg! In LOVE with this look! So fun how you paired overalls with sequins! What a fun look! Love the casual overalls with super glam jacket and heels. Gorgeous girl! Sequins and overalls!! You're speaking my outfit love language! Super cute!! This is such a chic way to wear overalls, so fun to see your overall styles girl! This sparkle jacket is so chic! I LOVE the outfit! You look stunning. You rocked this look so well! I would have never been able to wear sequins with overalls! I think what makes it work is that the denim is dark! You look great with this! And sequins with overalls, fantastic! I think I would look like a frumpy farmer in overalls, but you look great! I keep telling myself I will never buy overalls again because it makes me think of being 8 years old…however I keep seeing such cute posts like this and am reconsidering. This jacket was the perfect choice! SO adorable!! You are rocking them so good girl!! I've been on the hunt for some good overalls and these ones are perfect! I love that you dressed them up a bit with the sequins, a surprisingly great combo! I LOVE LOVE how you styled this!!!! I am not usually a overall fan but I love this look! thanks for sharing! Such a perfect outfit on you. This is without a doubt the chicest overall outfit ever! I love how you make overalls so chic! That blazer is to die for! What a cool and original outfit! Love the overalls. I've been wanting to get a pair and I love your style inspiration! The sequin jacket is such a unique added touch. I just love it! I never would have thought of this but it's amazing!! Really cool look! Love the overalls! They look perfect paired with heels! This is fierce!!!! I love this change in style. That jacket is to die for. I love how you styled these overalls – so chic! I tried on a few pairs the other day, but could not think of a way to style them, but I love the bit of sparkle from the jacket! Thanks for the inspiration! These overalls are really cute! The pockets and slim leg really updates the look! SAP Training institute In Noida– Webtrackker is an IT company and also provides SAP Training In Noida, Delhi, Meerut, and Ghaziabad By more than 7 years Exp SAP Certified Corporate Trainer.